U.S. tech companies continue to be the most active acquirers in the world, says a new report from Crunchbase and Mind the Bridge. 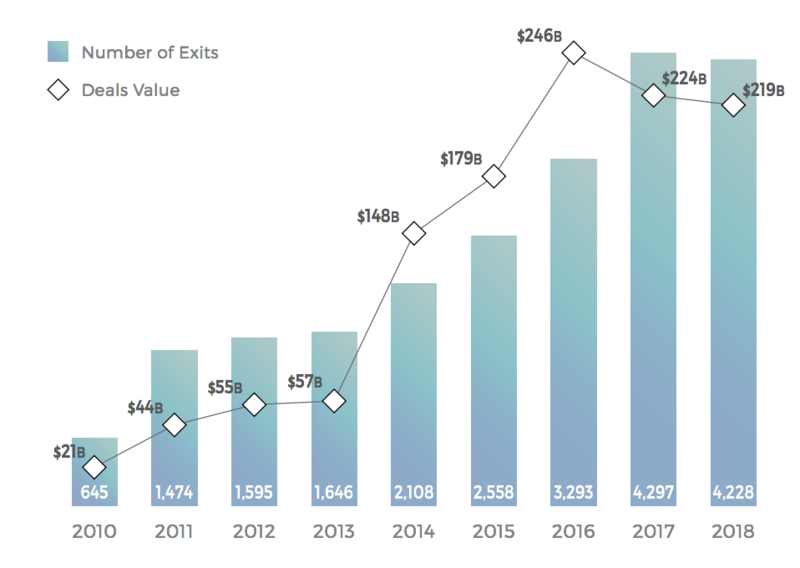 The pair crunched data on 22,000 startup exits since 2010, recording about 4,200 so far this year. U.S. companies, though less active this year than last, have acquired approximately 2x more startups than their European counterparts. Overall, 2018 is a flat year for M&A activity, despite a record-setting 2017. Here are a few key takeaways from the report, which you can read in full here. There was a slight decrease in activity in the U.S., but Europe has really pulled back. European companies have completed 11 percent fewer M&A deals YoY. U.S. and European companies continue to make up the bulk of M&A deals. More than three-quarters of the transactions and the money spent involved startups from North America and Europe. Twenty-two of the top 30 world acquirers are from the U.S., which remains the most active acquirer of European startups, though Europe is closing the gap. Google, Facebook, Apple and Microsoft are the world’s most active acquirers. The most active European acquirer is Paris-based Publicis Groupe, which is 20th on the list of top global acquirers. That’s a step up from last year, when the most active European acquirer was Germany’s SAP — 33rd on the list. European companies are increasingly buying more of their European counterparts. This year, 81 percent of European acquisitions were domestic versus 75 percent last year. Of the startups that exited, 55 percent were between five and 15 years old and had raised between $10 million and $100 million.